Review: Boss Tracks gets ignited as a vessel for the work of three nefarious cartoon individuals who may or may not relate to three Liverpudlians with a penchant for jacking hardware tackle. 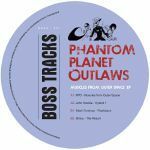 John Heckle, Mark Forshaw and Binny are formidable enough on their own, so combined as Phantom Planet Outlaws there's no shock to hear the acid raining down in a most expressive of ways. "Hybrid 1" finds Heckle squeezing atonal hooks out of his gear like a free jazz maverick while Forshaw fires off the whipcrack tones on "Flash Back". Binny meanwhile brings a malevolent twist on searing loopy techno to bare on "The Return" making this a record for only the toughest heads to drop.